It is 2015, and yet we still get requests from clients to declaw their cats. 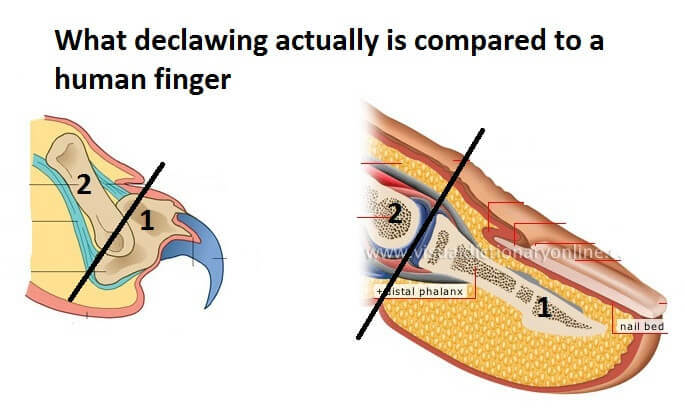 Although illegal in most of Europe and Australia, declawing is not (yet) illegal in the United States. 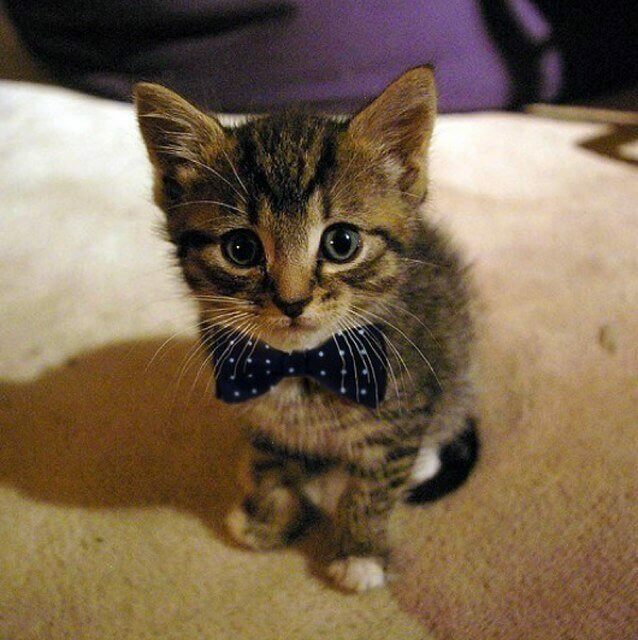 There are even a few American veterinary schools that now refuse to teach their students how to perform declaws. When push comes to shove, most veterinarians still perform the surgery (myself included). Most of us see it as a necessary evil: a last-ditch, salvage measure only performed in dire circumstances where the alternative is euthanasia, or the cat being turned into the shelter. Anytime I’m asked by a client “Do you recommend declawing cats?”, the answer of course is a resounding no. I can’t imagine any veterinarians recommend declawing cats. Anytime I’m asked by a client “Will you declaw my cat?”, the answer is a very reluctant maybe, after much discussion and client education. There are many alternatives to declawing cats. Regular nail trims (every 4 weeks or so) are the single best thing that clients can do to reduce their cat’s natural instinct to scratch. It is normal and natural cat behavior to scratch and claw items, and many will continue to try and do so even if they have been declawed. I am happy to teach clients to trim their cat’s nails; to be honest, this is a task best learned when Fluffy is a kitten but even adult cats can be trained to permit nail trims. I’m also a fan of the “kitty burrito”, where Fluffy is swaddled in a towel so one paw can be pulled out at a time; this burrito technique keeps those other paws from swatting you! Clients who struggle to trim their cats’ nails at home can always schedule nail trim appointments with their favorite veterinarian or groomer. Providing appropriate items and places for Fluffy to scratch is also vitally important. Some cats prefer carpeted “cat trees”, some prefer sisal or jute scratching posts, and some prefer cardboard incline scratchers. You may have to try a variety of different substrates before you find the one that Fluffy prefers. Consistently rewarding Fluffy with treats to reinforce appropriate scratching behavior is a great way to ensure she returns to her scratching post, and not to your carpets. Adding catnip to designated scratching areas is a way to attract Fluffy to the appropriate places. 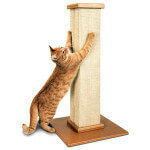 Simple things can be used to deter Fluffy from repeatedly scratching furniture or carpets. Covering a sofa arm in tin foil is an inexpensive, simple way to make furniture less appealing to your cat. For carpets, tin foil can also be used. Plastic carpet runners, turned upside down with the plastic points facing upward is another inexpensive deterrent to cover scratched carpeted areas. I’ve also had some clients use indoor electric fences to keep Fluffy out of certain rooms or areas of the house, which may prevent her from accessing previously scratched areas. A product called Soft Paws may be a solution for owners who struggle with trimming their cat’s nails. These are soft, rubbery caps applied with glue to cover the cat’s nails. They last upwards of a month or more, and can be applied by owners at home, or brought to your veterinary clinic to be applied. If all of these options have been tried, and failed, then I will discuss declawing with owners as a last resort. 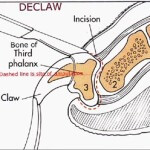 It is vitally important to me that owners understand what a declaw surgery entails. Contrary to the procedure’s name, we are not just surgically removing the nail. 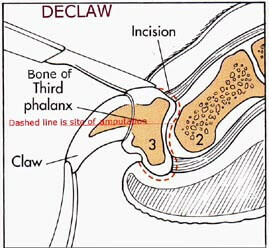 A declaw surgery involves the amputation of the third bone of every single digit on both front feet (thus, a total of 10 amputations). This bone, called P3, is where the nail bed is attached; a cat cannot be declawed without amputation of this bone. The surgery is comparable to cutting of a human’s finger at the last knuckle. Yes, we provide copious pain medication before, during and after declaw surgeries. Yes, we can use nerve blocks to “numb” the foot during surgery. Yes, some practices offer laser declawing, which often results in reduced blood loss and less post-op swelling. Despite all of our best efforts, the fact remains that declawing is an amputation of a bone on ten toes. Most cats do recover from declaw surgery after a few days, with intensive pain management and post-op nursing care. Unfortunately, I have seen a number of cats with chronic complications from declaw surgery, including temporary or permanent nerve damage, chronic pain (akin to “phantom limb” pain in humans), infection and nail regrowth. I will declaw a cat rather than euthanize it for scratching. I will declaw a cat rather than knowing it will be taken to the shelter for scratching. But I always want to ensure that every alternative option has been considered, and that clients understand what the surgery really entails. It’s a partial toe amputation, not a declaw!